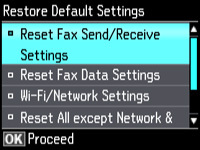 Press the left or right arrow button to select Setup, then press OK. Select one of the available options, then press OK. You see a confirmation screen. Select Yes or No, then press OK.